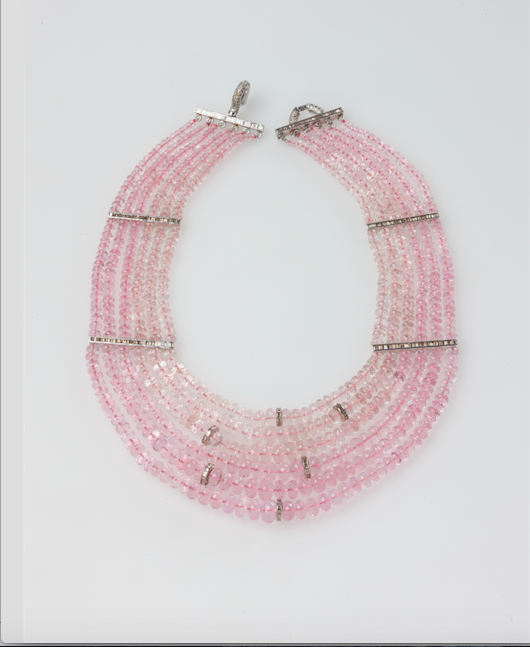 A stunningly beautiful, glamorous, six-strand morganite necklace: 3 strands of flesh pink followed by 3 strands of highly sought after rose pink faceted rondelle beads. The central area is highlighted with 6 gold rondelle beads set with champagne baguette diamonds. The necklace is suspended on two sets of spacer bars (each side) set with champagne baguette diamonds and attached to a 14 carat gold & diamonds clasp. The gold work is white rhodium plated yellow gold (so that the necklace can be turned into yellow gold just by removing the rhodium plating). The Countess owns numerous homes in various countries, however, her favourite residence is her Château in the French countryside. She is of mixed ancestry, and is of course beautiful, refined, cultured and highly educated – but we must preserve her privacy and security … and refrain from a personal description. Since her husband died she has been alone (out of choice), but after some years of self-imposed single life she is now ready to reassess, as her domestic future looks lonely.